Rope ladders are different from the regular types of ladders that you may be accustomed to. This is because they are especially designed for specific situations, and not everyone may be skilled enough, or even physically capable, of using these kinds of ladders. Here’s an in depth discussion on what rope ladders are, how they are used, and how to scale them safely. Rope ladders basically describe any form of ladder where in the rails, or the parts of the ladder that support the rungs, are made out of some form of rope. Rope ladders are designed to be easily thrown down a lower level platform, such as when boarding smaller ships. Rope ladders are also usually lighter and portable so that the can be easily pulled up or stored away. While rope ladders are typically made out of actual rope, any ladder where in the rails are flexible are considered as rope ladders. By this definition, rope ladder braces can be made out of chains, wires, or even synthetic material. These materials are used so that they can be easily deployed whenever needed. Rungs of rope ladders are normally made out of wood or metal. Dimensions vary, and oftentimes these are actually do-it-yourself jobs so there are really no standards on how wide the steps would be. On certain occasions, the same material that the rails are made out of are the same materials that the rungs are composed of. 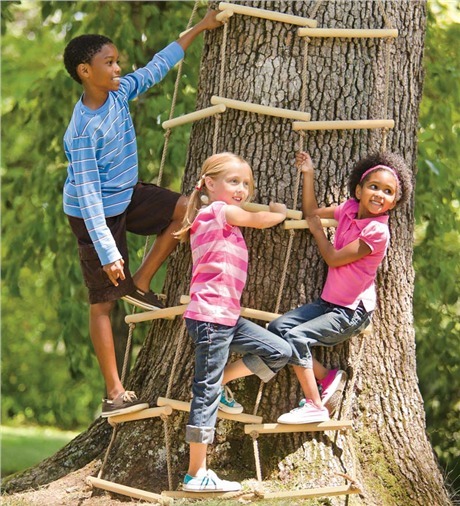 As previously mentioned, rope ladders are designed to be very light. Still, sturdiness should never be compromised. Less weight can be supported by rope ladders as compared to those made out of metal or other stronger substances. Thus, these are used in cases where in people and light equipment only are being carried. Rope ladders are used in situations where in typical ladders cannot be reasonably used. These include areas with small spaces, or in situations where in there are uneven surfaces for the ladder to be supported against. Rope ladders are also designed specifically for movement and not for work, which means that having free hands to perform jobs while on a ladder is not recommended. 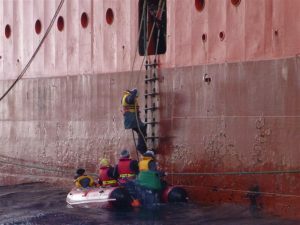 Due to waves as well as the irregular shapes of ship sides, rope ladders are more commonly used for boarding ships. Vessels must be side by side in order to have a safe distance for the user to jump from one location to another. These rope ladders are typically rolled from the larger vehicle onto the smaller one. Helicopters also use rope ladders for rescue missions. This is the best option for ladders due to the small capacity of choppers in terms of space and weight. Hikers and mountaineers, especially for technical climbs, normally use rope ladders as these are safer alternatives to rappelling using a single piece of rope. These ladders offer much more stability and can be set up easily. Rope ladders are used for steeply angled hills and for dangerous treks and can be used by beginners to complete their climbs. For outdoor events such as concerts of programs, rope ladders are typically used as they can be easily transported from one place to another whenever needed. Most backstage areas also have limited space, so clearance for normal ladders is not possible. In an environment where in quick response times in arranging lights, sounds, and effects on cue is essential, rope ladders are the best choice for these types of jobs. Rope ladders are much more difficult to climb as compared to other types of ladders. This is because rope ladders tend to swing from side to side or back and forth, and sometimes even in both directions at once. This is because of the inherent flexibility of the rails which is the reason why they are best suited for certain situations. As such, a lot of care must be undertaken in order to climb up and down ladders safely. These are some of the things that you would have to consider so that you can prevent falls, mishaps, and other types of accidents. Rope ladder users must always keep their balance. It is hard to maintain stability in rope ladders due to the lack of contact to stable surfaces. Keep your center of gravity low and towards the center of the ladder in order to minimize swaying. So that you can improve your balance, practice stepping on the middle of the rungs while grabbing onto each side of the rails. Most of the load, especially when going up, must be on the arms with the legs acting as support. As rope ladders have less points of contact with stable surfaces, the points where in contact is actually made must be able to support the weight that it must bear suitably. Rope ladders are usually hooked or tied around one or two points, and these must be checked for security and stability before a climb. Some rope ladders also have weights tied at the bottom so as to reduce wiggling. This provides a lowered center of gravity for the entire structure, which is especially important if one end of the ladder is free and during windy situations. Rope ladders are not designed for bearing a lot of weight. Thus, you would have to make sure to only bring the bare essentials when climbing up or down a rope ladder. It is also equally important to equally distribute the weight of whatever equipment that you will be bringing with you. Lastly, you should always keep your hands free, so any item should be stored away in pockets or in a bag. Ensure your protection when using rope ladders by wearing personal protection equipment such as hardhats. This can help minimize damage in case of falls or when bumping against hard surfaces during a climb. Wearing safety lines or harnesses are also recommended in the interest of personal safety.